"Beauty will save the world," her father used to joke. 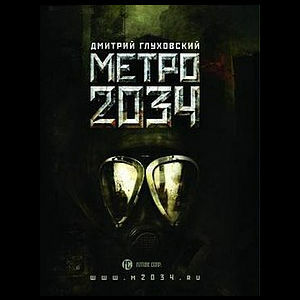 Metro 2034, Dmitry Glukhovsky's first sequel to Metro 2033, separates itself from the other books in the trilogy (and the entire series of video games) by not centering on the story of Artyom Alexeyevich. Instead, it follows a handful of characters that include a battle-broken soldier, an old man looking for immortality in the pages of a book he plans to write, and a young woman who spent her entire childhood in brutal exile. They are on a mission to save the post-apocalyptic Moscow Metro from a new threat, far less supernatural and mysterious than the Dark Ones but just as threatening to what little remains of humanity. Don't let this dissuade you from reading it, however. Much to my own surprise, Metro 2034 is an even better novel than its predecessor. No doubt it helps that all the legwork of universe-building has already been done, both by the first novel and by the wealth of expanded universe material provided by others, but even if this had been the first book to take place in this bleak underground microchosm, it would be no less compelling. For one thing, it's better written. Whether a result of a better translation or more mature writing from Glukhovsky, a lot more attention is paid to the poetry of the words on the page. The multiple perspectives also help flesh out the characters more--even though the point of view tends to wander a bit too often--and the focus on a more grounded threat without as many unexplained or unnatural distractions helps keep the story within the boundaries of suspended disbelief. On top of that, there are very few repetitive conveniences the way there are for Artyom's first adventure, which is important for a tale that isn't trying to be as mystical. There's an ethical conundrum underscoring the entire narrative, but instead of being fantastic and only morally ambiguous in the final moments (as the problem of the Dark Ones is for Artyom in Metro 2033), this novel's problem feels like something humanity has faced multiple times before and for which there is no simple solution. Each character makes moral choices that are questionable, and no one comes out feeling like a true paragon of virtue or an irredeemable scoundrel. The most relatable characters will make gravely questionable decisions, and the most despicable characters will choose to do right when you least expect them to. 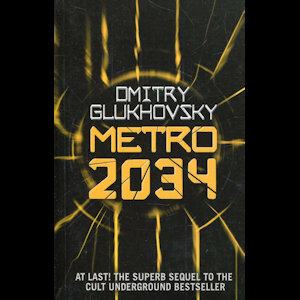 At the risk of spoiling things, the conclusion is appropriately mixed as well, not as bleak and seemingly hopeless as the final pages of Metro 2033, but not a truly happy ending either. In other words, it feels real, frighteningly so. Where Metro 2034 really excells, though, is in its characters. The closest thing it has to a central protagonist is Homer, an old man who survived the apocalypse because he was a Metro driver when it happened. He lost his wife and children and spent the decades that followed wandering the tunnels, collecting stories, fairy tales, and scraps of information about the past, in the hopes of clinging on to at least a little bit of humanity's lost glory. Whereas Artyom is more of a blank slate protagonist (in the first book, at least), Homer is a fully fleshed-out character overflowing with backstory, opinions, and deep motivations even he doesn't always comprehend. He is also the source of the book's meta-narrative: he is ostensibly writing the novel we are reading, recounting events in such a way that it's impossible to separate the embellishments of a seasoned storyteller from the "reality" of what happened. All of Glukhovsky's philosophical ponderings about storytelling and myth-making are put into this singular character, and through him, Glukhovsky delves into the blurry realm of fiction versus reality, exploring a possible lack of separation between what we experience and the art we choose to create. Homer wonders whether he writes to achieve immortality for himself, whether he's trying to pass on knowledge of the past to generations to come, or if he's just a man scribbling away to sate his own selfish desires. I have no doubt Glukhovsky is relating his own thoughts here, as I have no doubt any writer of any caliber can probably relate. The next major character is the brigadier, a horrifically scared soldier of little words, capable of incredible feats of violence and survival under even the harshest conditions. He is the most enigmatic of the book's protagonists, and his position as either the story's big hero or its major villain alternates a few times as things progress. The mission to save the Metro from its latest threat is one he undertakes with determination and single-minded focus, and he drags the seemingly useless Homer along for reasons he can't fully articulate. His history and his humanity are constantly unclear, but his seemingly superhuman skill is never called into question. Then there's Sasha, an impossibly naïve young woman who joins the group immediately after her sole companion--her father--succombs to his wounds and radiation sickness, leaving her to fend for herself in a hostile place where she is hated and villified. Homer urges her to join them, seeing her as his novel's triumphant heroine, but she is impatient with the old man. Despite her initial reluctance, though, she is drawn to help the brigadier by adolescent emotions she never learned to interpret. She enters the story slowly, but arguably becomes the most important character by the end, carrying the weight of the book's central theme on her shoulders as she refuses the advances of men who seek to exploit her or steal her away. She is beautiful without knowing it, and that beauty, as her father used to joke, may just hold the key to saving the world. The bottom line: if you read Metro 2033, you should read Metro 2034. It is an amazing story all its own, but even though its connections to the bigger story of Artyom are tangential at best, it's also an important part of the saga that shouldn't be left behind. The writing is more mature, the characters are more fascinating, and it never meanders or feels random. It is a startling journey with a few twists I guarantee you won't see coming, so even if you don't appreciate its more heady subtexts and philosophizing, you'll at least be entertained.